The data for any N-dimensional table could be analyzed using nothing more than the two-dimensional chi-square analyses of introductory statistics courses. Examining the constituent two-dimensional tables derived from a larger N-dimensional table would usually be characterized as piece-meal analysis, but could be justified as follow-up analyses, guided by log-linear results (as we show later)—much in the same way as, with continuous data, follow-up analyses are used to explicate significant analysis of variance interactions. Examining separate two-way tables can be useful in itself, but because ILOG users will most likely pursue such an examination as follow-up to log-linear analyses, it makes some sense to defer discussion of this topic until after log-linear analysis has been introduced. Nonetheless, we discuss examining two-way tables first because of the way it introduces concepts essential to log-linear analysis, but in the more familiar context of two-dimensional chi-square. To invoke the ILOG procedure that gives counts and other statistics for two-dimensional tables, select Run > Examine as Two-Way Tables. You then name the factors for the rows and columns of the two-dimensional table you wish to examine and indicate whether other factors should be pooled (tables are collapsed over such factors) or listed (separate two-dimensional tables for each level of such factors are displayed, or combinations of levels if more than one factor is listed). 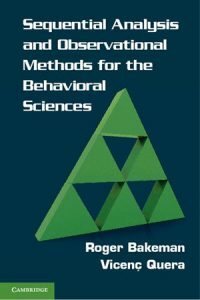 Appropriate statistics for each two-dimensional table are then displayed: observed and expected frequencies and adjusted residuals for each cell, chi-square for each table, and the odds ratio and Yule’s Q for 2×2 tables (for detailed definitions of these and other cell and table statistics see Bakeman & Gottman, 1997; Bakeman & Quera, 2011). For example, for the object struggle data, we might request that rows represent Prior Possession and columns Resistance, listed separately by Age, but pooled over Dominance (see below). Analyzing the toddler and preschool tables separately shows a significant chi-square for preschoolers but not toddlers (p = .013 vs. .47). For preschoolers, the odds that the holder resisted when the taker had prior possession were less than when the taker did not have prior possession: OR = 0.27 [0.09, 0.78]—95% confidence interval (CI) in brackets. In contrast, for toddlers, the odds that the holder resisted when the taker had prior possession were somewhat greater than when the taker did not have prior possession, but not significantly so: OR = 1.33 [0.62, 2.86]. Because we checked odds ratio for Write checked stats, these statistics were displayed in the ILOG results window, as shown below. In sum, a piece-meal analysis would suggest that a taker’s prior possession decreased the holder’s resistance for preschoolers, but had little effect on toddlers. This piece-meal analysis, however, only tells us that the prior possession-resistance association was statistically significantly just for preschoolers (the 95% CI excluded 1) but not for toddlers. In particular, it does not tell us whether the difference between the toddler and preschool effect was itself statistically significant. 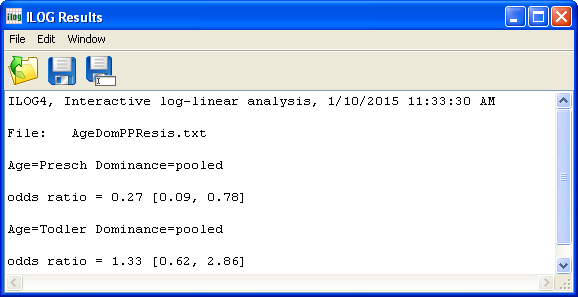 For that a log-linear analysis is needed. Nonetheless, the Examine as Two-Way Tables procedure provides a powerful way to explore a multi-way contingency table.